Inside the 23rd Street Armory during the annual Oktoberfest celebration. 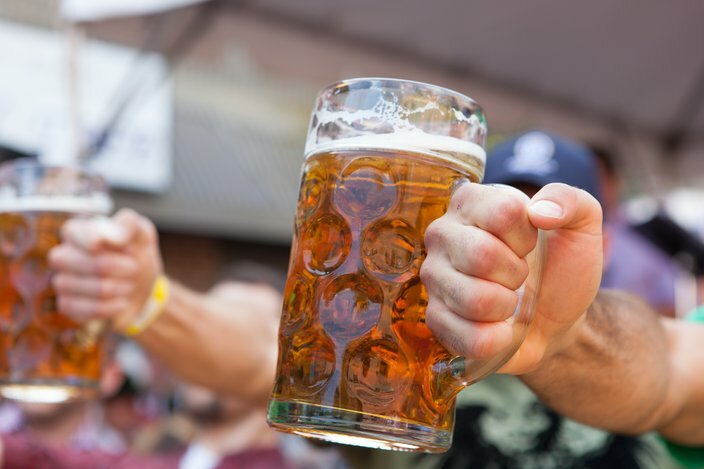 It's that time of year again, time to chug fall brews out of overflowing beer steins, eat warm Bavarian pretzels as big as your face and let loose on the dance floor to polka music. In Philly, there are tons of Oktoberfest celebrations to check out in September and early October. We've made it easy by rounding up the top ones below – you just need to pick one (or more) and go. Through the first Saturday in October, McGillin's Old Ale House will serve Oktoberfest beers and German food specials. Enjoy Oktoberfest brews from Sly Fox, Lancaster, Stoudt’s, Beck’s and Warsteiner Brewing, as well as a selection of pumpkin beers. The historic bar will also serve its own Oktoberfest beer, created with Fordham & Dominion Brewing Company. The Philadelphia Zoo is getting in the Oktoberfest spirit early. On Saturday, Sept. 15, sample as many brews as you please – there will be more than 100 – and check out the animal exhibits. Keeper demonstrations and animal meet-and-greets will take place throughout the night as well. For the 10th year, the South Street Oktoberfest will be held out front of Brauhaus Schmitz, beneath a massive tent, rain or shine. Either pay-as-you-go for all food and drink, or upgrade to VIP for $115. 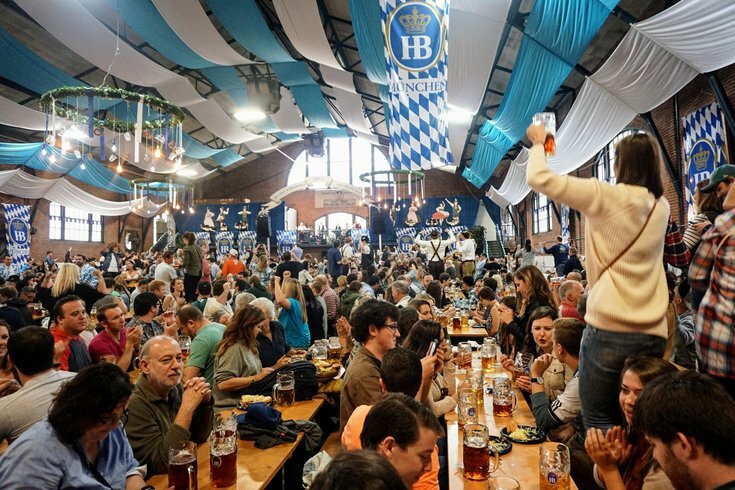 The VIP package includes access to VIP bathrooms, a Bavarian buffet from 1 to 6 p.m., six tokens to use for beer, an official "Brauhaus Oktoberfest" T-shirt, sunglasses and a glass liter stein filled with "Oktoberfest survival supplies" to take home. To entertain all attendees, there will be the annual "Liter Lift Competition," as well as live music and German folk dancers. Fishtown neighbors Frankford Hall and Fette Sau will host the eighth PHLOktoberfest on Saturday, Sept. 22. The all-day party will take place on Frankford Avenue, where there will be traditional German food, seasonal brews and live entertainment. Also, the festival will include a special family-friendly area. Kids can enjoy face-painting, pony rides and more. Xfinity Live! will host Oktoberfest Live! for the seventh year on Saturday Sept. 22. Attendees can enjoy unlimited samples of the best fall and early winter beers, including pumpkin and Okotberfest styles, while enjoying live music throughout the day. In total, there will be more than 250 beers available to taste. There will be an Oktoberfest celebration in downtown Ardmore on Saturday, Sept. 29. Enjoy German food, lots of fall beers and cider, live entertainment and dancing. Kids can also get in on the Oktoberfest fun with cookie decorating, pumpkin decorating, crafts, face painting and other outdoor activities. Before heading over, just remember this is a cash-only event. Take a break from Philly and head to New Jersey for this Oktoberfest celebration on Saturday, Sept. 29. There will be a huge tent decorated in blue and white on Haddon Avenue, where attendees can drink from giant beer steins, eat traditional German food and listen to live music. Pay-as-you-go for all food and drink, or upgrade to VIP for $25. Included is reserved seating, a keepsake glass mug and one beer. 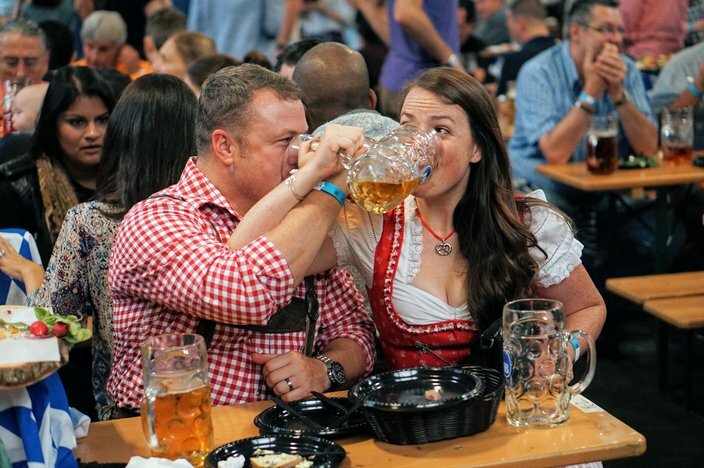 Drink up at the 23rd Street Armory Oktoberfest. There are three sessions to choose from for the third 23rd Street Armory Oktoberfest. On both Friday, Oct. 5, and Saturday, Oct. 6, there will be a 7:30 to 11:30 p.m. session. Saturday will also include an earlier session, from 1 to 5 p.m.
For the event, the 16,000-square-foot space will be decked out with Bavarian blue and white and authentic festival tables and benches imported from Germany. Attendees can enjoy German food and beer, as well as live music and dance performances. General admission is $25 and includes a beer and giant pretzel. There are also two VIP options. For the seventh year, there will be an Oktoberfest celebration outside the King of Prussia Mall. At the party on Saturday, Oct. 6, there will be 100-plus beers available to sample, dishes from popular King of Prussia restaurants, live music on two stages and a cigar lounge. Tickets, which include unlimited 2-ounce pours, are available for two sessions: noon to 3:30 p.m. and 6 to 9:30 p.m. This year, there's also a VIP option. The Roxborough neighborhood is once again hosting its own Oktoberfest celebration with beer, live music, games, food trucks and German folk dancers.